To purchase the IVR service, talk to your Site Manager. You will require a recorded greeting to play to callers, explaining which menu options to press. There are iPhone and Android apps that can record in the required format for you. If you wish to use alternate software, you must ensure the recording is in a WAV file, the sample rate is 8000Hz and the encoding is unsigned 8-bit PCM. 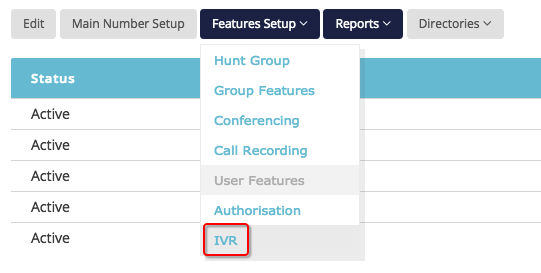 Once enabled, you can manage your IVR settings via Telephone Manager. Give the IVR a suitable name to help you to keep track of what purpose it was created for, then pick an extension that the IVR will be driven from. Within 'Time Options', choose whether you want the message and options to be the same for both business hours and out-of-hours or if you want separate choices for these. Here you will upload the file containing your greeting and choose which menu options you wish to activate, and what actions they will perform. Once you are happy with your configuration, clicking 'Continue' will allow you to repeat this process for your out-of-hours menu (if selected) or otherwise completes the setup and activates the IVR.